We were excited to be recognized by Efficiency Vermont for one of our recent projects in Southern, VT with a Best of the Best Award for Innovation in Residential New Construction. This was a collaborative project with Webster Construction and Mathes Hulme Builders. Architectural design by Robert Swinburne. Interior design by Joanne Palmisano. Lighting design by Brilliant! Lighting & Design. Project management by HELM. Professional finished photography by Lindsay Selin Photography. Our project was accepted into Efficiency Vermont’s Residential New Homes Program as a pilot project. Despite the fact that the building was existing (an early to mid‐1800’s timber frame barn), the renovations were significant enough to warrant entry into the New Homes Program. The existing structure is a 30x30 timber frame barn that at one point had been converted into a “living space”. The existing frame was in OK condition, though far from plumb and square. The rubble foundation was compromised in several areas. The building showed signs of rodent and insect infestation and the envelope was un-insulated and connected to a dirt crawlspace. Our clients purchased the barn and the surrounding 85 acres of forested land with the hopes of salvaging the existing building and converting it into a modest, efficient and healthy vacation home for their family and the generations to come. The initial blower door number performed by Steve Spatz at Efficiency Vermont measured in at 23 ACH50. Our primary goal with the project was to do a deep energy retrofit in order to minimize the air infiltration, increase the thermal envelope, improve the overall health, efficiency and longevity of the building, while significantly improving the function and aesthetics of the building and property along the way. New construction was a consideration but the team wanted to preserve the historic timber frame structure and minimize our overall carbon footprint on the project. The finished product is a beautiful modern‐meets‐rustic aesthetic in a very air tight, extremely efficient, healthy and comfortable home. The building sits at a high point on the lot in Southern Vermont, surrounded by mountain ranges and an abundance of wildlife (including a bear that made several visits to site over the course of construction). Efforts were made throughout the project to salvage as much of the existing structure and materials as possible. The previous owners left a barn full of furniture and belongings, many of which were donated. The timber frame structure and existing interior tongue and groove boards were maintained intact. 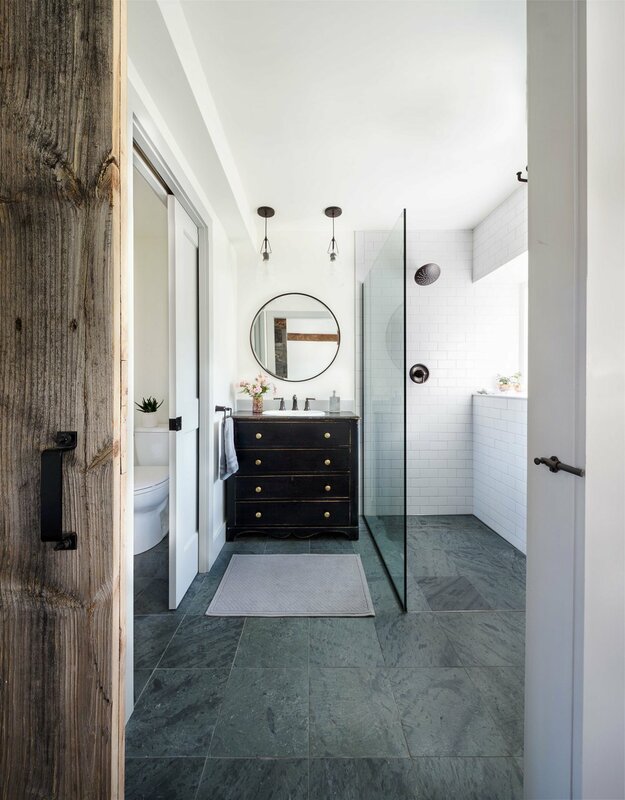 The siding was reclaimed and used to build custom barn doors for the main bathroom and master bedroom, interior finishes in the basement and patching areas of the attached shed and garage. Existing interior doors were patched, painted and re‐hung, existing windows were re‐purposed as mirrors. Even the previous deck boards were re‐used in portions of the basement build out. Sections of the existing pine flooring were carefully removed from areas receiving tile and used to patch‐in where new flooring was needed. The first floor includes an accessible bedroom and bathroom with curb‐less shower. Numerous built‐ins, nooks and shelves were installed into the extra deep walls to make the best use of the very small footprint. Efficient appliances, plumbing and lighting fixtures were installed throughout. Most of the rough sawn materials, the siding, the flooring, the stair treads and railings were sourced from a local sawyer. All of the subcontractors and craftspeople contributing to the project were from a 30‐mile radius of the site. HVAC - The existing building had an old and poorly designed oil‐burning forced hot air furnace, an open wood fireplace (without a chimney liner), a 30‐gallon electric hot water heater and overall undersized electrical service. We upgraded to a 200-amp service for the property. A 30,000 BTU Mitsubishi Electric Hyper‐Heat outdoor condenser with two 15,000 indoor units were installed for primary heating and cooling on the main living level. A propane fired Rinnai EX 11 heater was installed in the basement. The chimney was lined and a new wood burning insert was installed (with dedicated make up air). The hot water heater was upgraded to a super high efficiency Rinnai RUC98iP tankless on‐demand unit. In addition, the clients leased two TESLA Powerwall batteries to provide back up power during outages (of which there are numerous in this remote location). Air Sealing & Ventilation - Existing siding and roofing were removed from the entire building. The siding was salvaged and re‐used in a variety of locations on the project. A smart air barrier membrane (Intesana from 475) was installed around the entire building, taped, sealed and connected to the sill. New double pane Marvin all Ultrex windows and doors were installed throughout. Dedicated make‐up air was provided for the new wood fireplace insert. A Lunos NEXXT HRV, Panasonic bathroom exhaust fans on timers and a low CFM range hood were installed to provide continuous balanced ventilation. We are proud to report that the final blower door number was a 90% reduction in air leakage, testing out at 2.3 ACH50! Envelope - TJIs were installed on the existing 2x4 walls. Dense pack cellulose was installed in the wall cavities to an average of R‐42. The roof was packed out with TJIs and dense pack cellulose was installed to an average of R‐65. One particular challenge and the reason for the averages was the fact that the existing frame was racked in one direction. Our team was working to preserve the interior tongue and groove board finish and avoid having to disassemble the existing frame. The TJIs needed to be shimmed and adjusted to ensure the outer layer of the exterior envelope was plumb and square. This resulted in a more uniform building shape while maintaining symmetry between windows and exterior trim details. Lastly, a smart vapor control layer (Mento plus from 475) was installed outside the thermal layer. Installed over the Mento was a drainage plane, locally sourced raw hemlock vertical siding and asphalt shingles at the roof.